The NCRS Judging System is quite complex- don't go in without a guide! This manual outlines all rules, procedures, and policies pertaining to NCRS judging events held world-wide, conducting an NCRS Judging School, Duntov Mark of Excellence Awards, McLellan Mark of Excellence Awards, Flight Awards, Performance Verification Testing, Sportsman Award, Chevrolet Bowtie/Star Awards, NCRS Crossed Flags Award, NCRS Founders Award, etc. 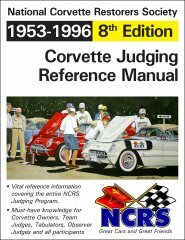 It's must-have knowledge for Corvette owners, NCRS Team Judges, Tabulators, Observer Judges, and all participants. If you are restoring a car to be judged- there is information in this manual vital for making decisions as on how to proceed, where to spend money and where you don't need to! This manual is a must have if you ever plan on having your car judged- now or in the future. Get FREE copies of the NCRS Flight Scoring Sheets for your car!